Blocking a member makes it so that any messages they send you are not able to be seen by you. You can block anyone you don't like, including annoying members and assholes members. You should block annoying people, and you should both block and report assholes. Note that blocking a member does not disable their ability to look at your house, nor does it make it so they cannot see or comment on wiki-pages you own. To prevent someone(s) from viewing your wiki-page, forum or password protect it and there is no way to prevent someone from looking at your house. Go to the member's house, look on the top for the "Block this Member" member and click it. 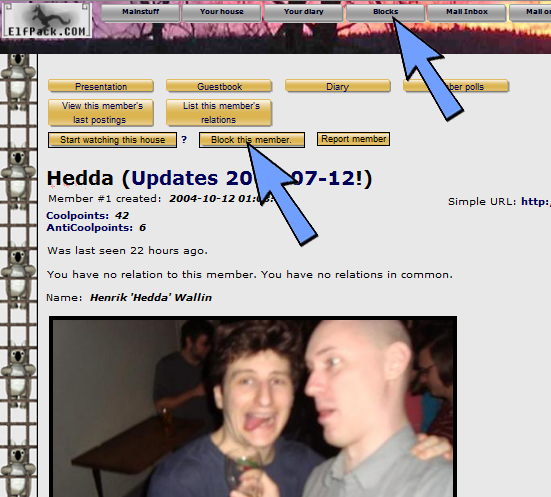 To manage your blocks, click on the "Blocks" button in the navigation bar at the top of each page. You can view all the members you have blocked, and remove a black if you decide. 2005-12-23 [GONE NEVER COMING BACK!!!! ]: huh ? 2006-02-20 [Sunrose]: :O everyone wants my boots! 2012-01-25 [Stephen]: This image should be updated.